A guide to getting to the venues & to road restrictions, etc. Click here for list of Olympic buses, traffic restrictions, etc. Olympic ticket holders travel free to and from the Olympic venues. Tickets must be produced if requested. 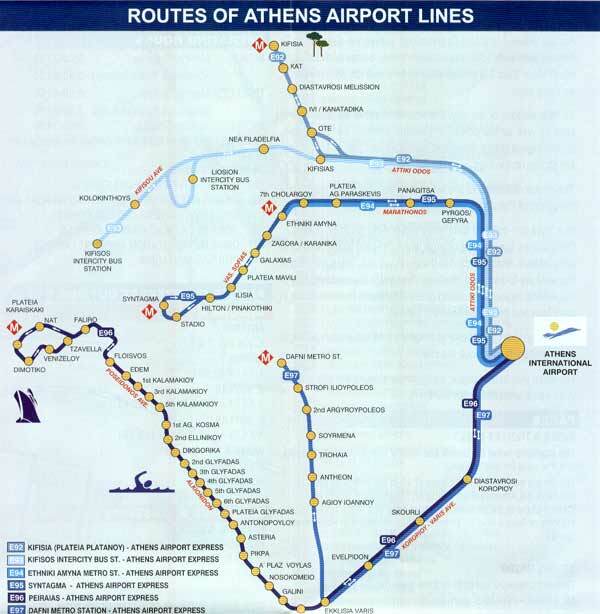 The Olympic bus network includes 22 lines and connects Athens and Piraeus to the Olympic venues. These buses are identified by the letter X and a number (e.g. X14, X22, etc. ), while buses serving Markopoulo, Schinias and Marathonas venues are identified by the letter Z and a number (Z10, Z11, etc.). T-shirts, Polo shirts, pins, etc., etc. 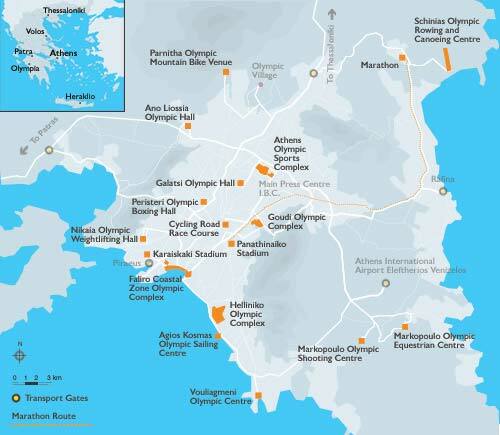 · Organizers have designated an Olympic Primary Road Network (OPRN) that connects all competition and non-competition venues throughout the Attica region, as well as the city center, the airport and the port. All the avenues and highways within the OPRN feature at least one Olympic Lane designated for credentialed vehicles (accredited vehicles transporting the Olympic family, ATHOC personnel and volunteers, and VIPs - usually the left lane), and one bus lane (the far right lane) for public transportation buses. The Olympic lanes are indicated by colored Olympic rings painted on the asphalt, and will be closely monitored by traffic police. Approximately 6,000 accredited vehicles are expected to use the designated Olympic lanes during the Games. Other (center) lanes will handle regular traffic and taxis. Emergency vehicles will have automatic access to any lane. 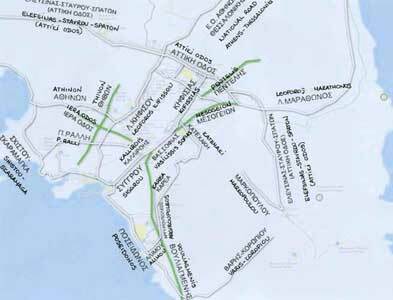 · The Olympic Road Network (OPRN) consists of the following roads: Poseidonos Ave. (from the junction with Omiridou Skylitsi to the Varis - Koropiou Ave., Sygrou Ave., Ardittou Ave., Vas. Konstantinou Ave., Vas Sofias Ave., Kifissias Ave., Petrou Ralli Ave. (from the junction with Kifissou Ave. to the entrance to the Nikaia Olympic Weightlifting Hall), Katehaki Ave. (from Kifissias Ave. to the entrance to the Ymittos Ring Road), Kokkinopoulou St., G. Papandreou Ave., Oulof Palme Ave. to Efroniou St., connecting roads I1 (from Porto Rafti Ave. to the Markopoulo Olympic Equestrian Centre), S2 and S6 (from the junction of Markopoulo Ave. with Porto Rafti Ave. to the Markopoulo Olympic Shooting Centre), Marathonos Ave. (from the Pallini/Pikermi junction to the junction with Souliou St.), 34th Syntagmatos St. and Kato Souliou Ave. (from Marathonos Ave. to the entrance of Schinias Olympic Rowing and Canoeing Centre). 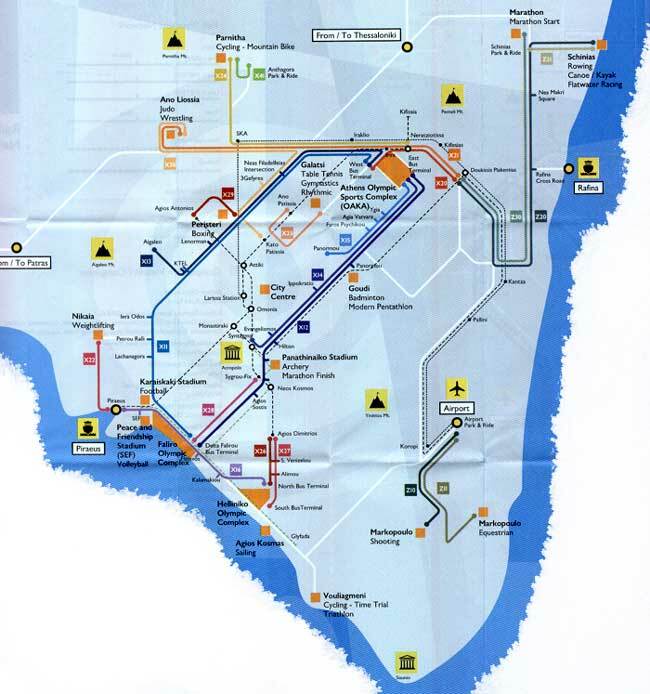 · The Olympic lanes measures will be in effect August 1-31, daily from 06:30 - 24:00. During the Paralympics there will be no Olympic lanes or other restrictions, except for facilitation of traffic flow by the traffic police. 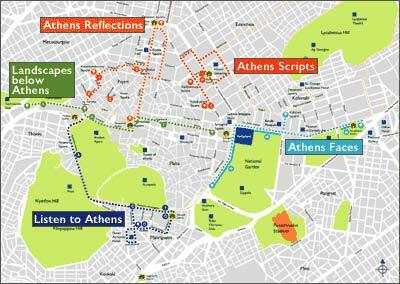 · Traffic restrictions and monitoring will be tight within the OPRN and around the center of the city of Athens. Traffic Police will be assigned to all traffic lights along the main avenues of the Olympic ring to ensure the smooth flow of traffic. More than 200 cameras placed along those streets will monitor traffic conditions throughout the day. Special traffic diversions will also be implemented within the Olympic traffic ring, such as banning left turns from main arteries (including Vas. Sophias and Kifissias Avenues going north). · In areas close to Olympic venues and around main road arteries, store deliveries will be permitted only during the night (between midnight and 7 AM). Waste collection will also take place during the night (from 10 PM to 7 AM). 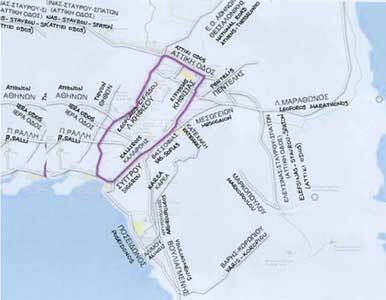 · There will be no Olympic lane on the Attiki Odos. · The streets around Olympic venues will be completely closed off to traffic for non-accredited vehicles (controlled traffic zones), while parking will also be restricted in a greater area approximately 500 meters around each site (controlled parking zones). Residents of those areas will go through a special ATHOC traffic access accreditation procedure and will be provided with passes allowing them entry into the no-traffic and no-parking zones, and access to their homes (see separate memo on Special Traffic Arrangements Around Venues). 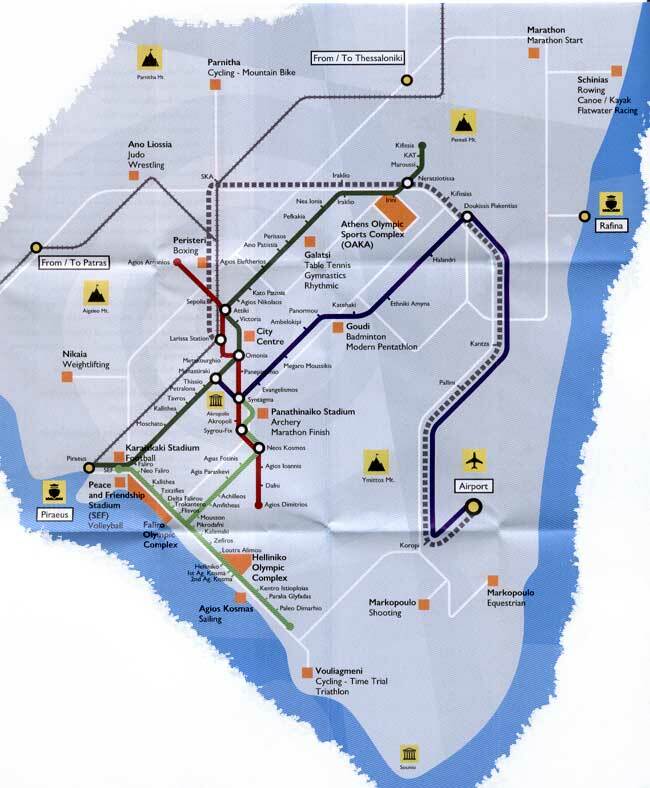 For ticket holders, competition venues will be accessible only through public transportation. · The main port access road will also feature one designated Olympic lane for accredited vehicles. Most passenger vessels will be moved to Rafina during August 2004 and will operate out of that port. The current ferryboat facilities in Piraeus are being gradually relocated to a new area of the port, away from the sectioned-off berthing area for the Olympic cruise ships. 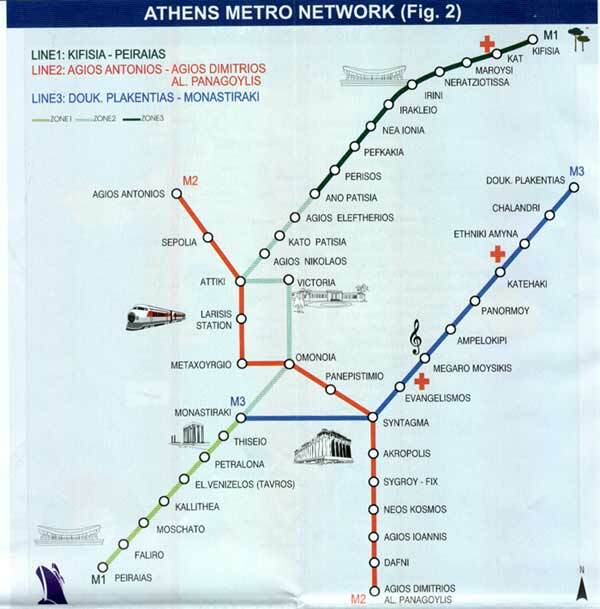 With these measures in place, ATHOC estimates travel time from Piraeus to the OAKA stadium at approximately 45 minutes. · The measures for the circulation of heavy vehicles, the provisioning of businesses and distribution of goods will apply from 2 August to 4 September 2004. The measures will be implemented in the following areas: Olympic Road Network (ORN), Centre of Athens (inner ring), Piraeus Port, coastal zone from Pireaus to Glyfada, the controlled parking and access zones, and on the routes where the Road Events will be held. · In the Olympic Road Network (OPRN - see roads listed above), circulation and provisioning by trucks weighing more than 3.5 tons (gross) shall take place between 02:00-06:00. · On Parnithos Ave. from 23 to 28 August 2004, deliveries by lorries weighing over 3.5 tons (gross) will take place between 20:30 and 06:00. On the other days provisioning will be possible at all times. · Trucks weighing more than 3.5 tons are exceptionally allowed to circulate on the following ORN roads (no parking or stopping is allowed): National Roads, Kifissou Ave., Attiki Odos, Ymittos Ring Road, Marathonos Ave. from Attiki Odos to the Pallini/Pikermi interchange, Markopoulou Ave. and Lavriou Ave., Porto Rafti Ave., Varis-Koropiou Ave., Kymis Ave. (underpass), Pireos St. (from its junction with Iera Odos in the direction of Piraeus, Alipedou-Gounari-Akti Poseidonos (lorry approach routes to the Port of Piraeus) and Athinon Ave.
· In the Athens city center (Olympic inner traffic ring), traffic circulation and provisioning by vehicles over 3.5 tons will take place between 02:00 and 06:00. 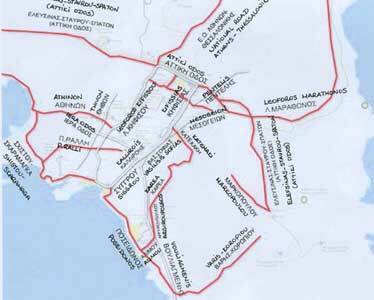 The roads in the inner ring area are: Alexandras Ave., Amalias Ave., and Vas. Alexandrou Street (from Vas. Sofias Ave. to Emfronisou Str. ), Vas. Georgiou Str. (from Vas. Sofias Ave. to Filellinon Str. ), El. Venizelou Ave. (Panepistimiou Str. ), Ventiri Street, Vourvachi Street (from Sygrou Ave. to Kallirois Str. ), Diakou Str. (from Ardittou Str. to Sygrou Ave.), Emfronisou Str. (from V. Alexandrou Str. to Vas. Konstantinou Ave.), Irodou Attikou Str., Misthou Str., (from Antinoros Str. to Vas. Alexandrou Street), Michalakopoulou Str. (from Papadiamantopulou Str. to Vas. Alexandrou Str. ), M. Mousourou Str. (from Vas. Konstantinou Ave. to Ymittou Str. ), the roads leading to Omonia Square, Papadiamantopoulou Str. (from Michalakopoulou Str. to Vas. Sofias Ave.), Potamianou Str. (from Alkmanos Str. to Antimachou Str. ), Rigillis Str., Rizari Str. (from Efroniou to Vas. Konstantinou Ave.), Filellinon Str. and Hatzigianni Mexi Str. · In Controlled Access & Circulation Zones (TCZs), circulation by vehicles over 3.5 tons is permitted from 24:00 to 07:00, with the necessary adjustments according to the operation schedule for each Venue. The above measure also applies for the TCZ at the Panathinaiko Stadium, even though this is located inside the inner ring. · In the Controlled Parking Zones (PCZs), vehicles (cars and lorries) are permitted to circulate throughout the day (24 hours). Provisioning by vehicles weighing over 3.5 tons will be permitted between 24:00 and 07:00.